The best part about getting photographs in cards this time of year is the clothing that people wear. There seems to be an entire industry built around the concept of people needing a ridiculous sweater for their family photo. There is no public place appropriate to wear them but having photographic evidence seems to be ok. I love egg nog, and as such love the title of this strip. Oh, Biff… May you never cease to amaze us all. Side note: Due to the placement of the cloud, it almost looks as if where Biff’s head was is smoking. Like he blew it up or some such. Which is about as expected from Biff. I have been the victim of such horrendous outerwear on several occasions. LOL you have to wear the horrible sweaters that you got for a present in photo evidence as PROOF. That way when your great aunt Bertha says “I never see you in that lovely (read:hideous) sweater I go you last year” you can pull out the photo, and say “See, Here I am, with the sweater, see?.” and feel perfectly comfortable never using it in public again. Ug even in comic form that sweater is atrocious. Well, at least no embarrasing photos. Man that’s the worst sweater I’ve seen. When I look at this picture, I just get the gut feelings that Biff’s eyebrows should be immune to invisibility, and therefore visible, floating above and around the horrible sweater. 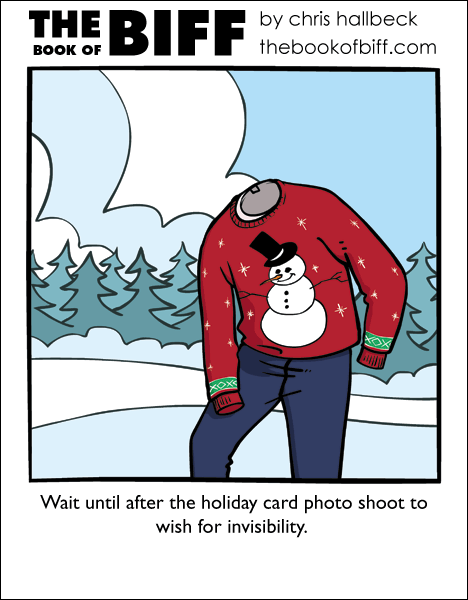 If I were wearing THAT sweater, I’d want to become invisble, too! Like a Biff-style Cheshire Cat, the eyebrows should be the last thing to fade..? Outstanding! Oh, and I like Nog, too. In fact, I’m a Nog-fiend. Timmy’s Dad has *nothing* on me when it comes to hoggin’ the Nog! I had a sweater like that once. @Kurast – Well, now you know what happened to it. At least no one will know who the sucker is that was forced to wear that hideous thing. Biff can’t even do that anymore! I like that you drew the tag. *shudders* i used to have a sweater that would make ray charles run in sheer abject terror X(. no joke it could cause pysical pain just from LOOKING at it…. I never had to deal with Christmas card photos. My parents had a hard time keeping me still. I was very hyper, if you couldn’t tell. I have a red sweater that is now hanging in my closet. I rarely wear it.